If you are looking for a special gift for your little princess, MySunshineShoppe.com has the perfect gift for your little girl. They specialize in adorable gifts for women and girls of all ages. Recently, My Sunshine Shoppe came out with a beautiful line of chunky jewelry. Their new chunky jewelry comes in vibrant colors and durable designs that will put a gleam in any little girl’s eye. My seven-year-old daughter loves anything pink. In fact, 90% of her wardrobe is pink. 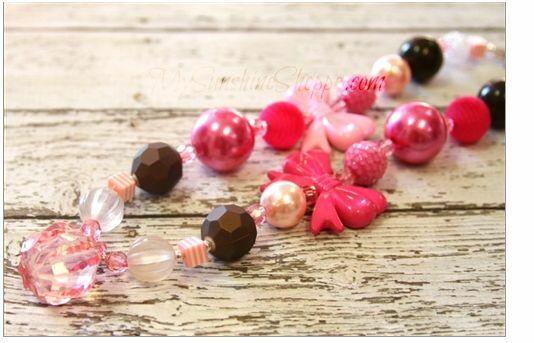 Her “My Girl” chunky necklace from My Sunshine Shoppe looks darling with all her outfits. Each necklace is composed of premium acrylic beads, resins, and stainless steel hardware in order to hold up for the long run. With Easter, First Holy Communion, Mother’s Day, Graduation and spring birthdays coming up, you are sure to find the perfect gift for your mother, sister, friend and little girl at My Sunshine Shoppe. For the beautiful dancer that loves to twirl and dance, they’ve created the Ballerina Girl necklace. Pale pinks and silver add a sweet note to her favorite costumes and set the stage for a brilliant performance. If your daughter loves the outdoors then the Butterfly Garden Necklace with its grass green and aqua beads is sure to please. My Sunshine Shoppe was launched in 2009 by pharmacist turned mom-preneur Lisa Hustad. The company has partnered with headbandsofhope.org–a company that donates headbands to girls with cancer, with a portion of their sales also going to St. Baldrick’s Foundation to fund life-saving childhood cancer research. A headband may seem like a small gift, but to a girl or woman who has lost all her hair it can go a long way towards making them feel feminine and beautiful again. My Sunshine Shoppe is proud to be the sole headband manufacturer of the company and a part of such worthwhile cause. For more information on My Sunshine Shoppe visit MySunshineShoppe.com. * Disclosure: I received a chunky necklace from My Sunshine Shoppe in exchange for this review. All opinions are accurate and 100% mine.